Note! Both that first Xiaomi Mi Box released in 2016 and its successor Xiaomi Mi Box S from Xiaomi are targeting an international/global market and was both developed in partnership with Google's own Android TV team, and since their release they have inofficially replaced Google's own Nexus series of boxes. 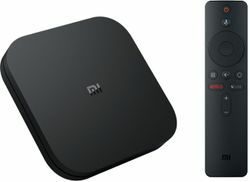 Xiaomi had before that released and still have also a whole series of other Android TV boxes made for the Chinese market that also called "Xiaomi Mi Box" (still being sold as Xiaomi Mi Box Enhanced / Xiaomi Mi Box Pro / Xiaomi Mi Box 3 / Xiaomi Mi Box 4), and while the hardware of those boxes made for the Chinese market are similar they have other firmware which do not include Google Play services support and will not be covered in this article. Running the Android TV6.0 operating system or later on a Amlogic S905X SoC (System on Chip), the Xiaomi Mi Box and Xiaomi Mi Box S comes with remote friendly versions of Netflix, Vudu, Hulu, HBO, UltraFlix, Fox, Sling TV, Google Play Movies, and other video service clients, with many supporting videos in native 4K Ultra HD (2160p) resolution at up to 60 frames-per-second and HDR. The Android TV platform delivers good conversational voice search for the native Android TV (leanback) app via an integrated microphone inside the included game controller. These features of Android TV with Google Play support combined with good hardware and firmware makes it a very good convergence device when pairing with Kodi for media playback. Normal "vanilla" builds of Kodi should run just fine on the Mi Box. You can use standard Bluetooth accessories, such as a wireless keyboard, mouse, or game controller. It should be possible to pair other bluetooth controllers and remotes to the Xiaomi Mi Box. Most of these devices will likely show up as a keyboard type input. This page was last edited on 26 January 2019, at 12:32.